sheriff | Where is @rusnivek? Immediate posts are important, but using valuable social media space is way more important. This was evident when this press release was plainly copied and pasted into this Sheriff’s Facebook page. On social media, people already know that your posts are for “immediate release” because Facebook puts your status in the timeline and then time/date stamps it for everyone. Also writing with all caps infers YELLING or SCREAMING. As public servants, we strive to bring peace to stressful situations including in messaging. 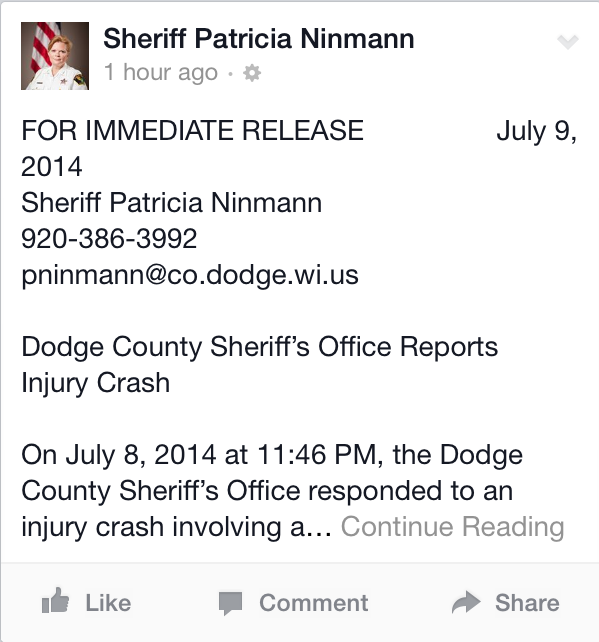 On Facebook, Sheriff’s name is listed right at the top so it isn’t necessary to repeat it again in the content. Email address in a post? Most likely, people will just click the “Comment” button below your post and respond back. They will likely not email you questions. That space you are using is PRIME digital real estate. Do not repeat already posted information as readers will rapidly lose interest in your post. But DO write a concise and interesting status update with picture(s) to draw more interest from your audience. Remember that social media is a visual medium. You identify the agency responding to the incident and the incident itself. You pull the reader in with a leading headline and help news reporters write their story. You use a picture from the incident that helps increase interest in your post. 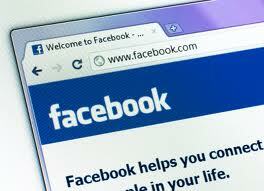 You use Facebook’s prime digital real estate in everyone’s timeline and push good information. Just like any other service, social media platforms are bound to go down. And when that happens, a small amount of the population does NOT know how to react appropriately. Some residents of California decided that calling 9-1-1 was their only resort to getting logged back into Facebook. Ahem. Clearly, this is NOT an emergency. 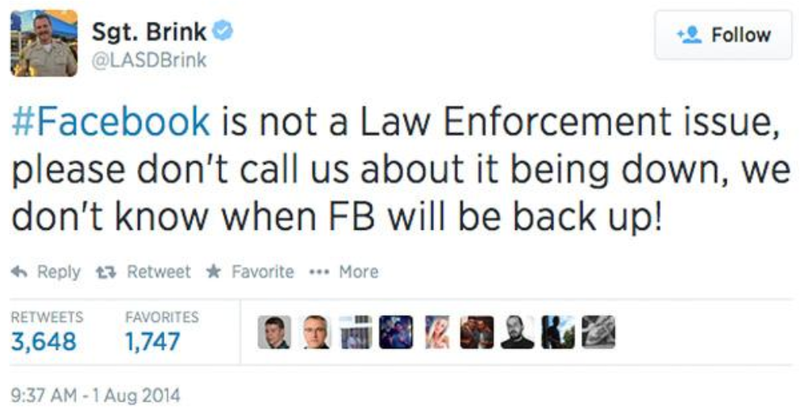 Sgt Brink is right in making it very clear to his audience (on Twitter) that Facebook’s non-service is not a Law Enforcement issue. Common sense right? Most agencies should have an easy contingency plan when this type of situation happens. Social Media postings and engagement will help decrease calls to various public safety agencies…including during non-emergency times. So having this type of canned responses ready to push out when a major social media platform has the hiccups, might help your constituents navigate their (loss of) digital life. Additional use of a trending hashtag will bring more visibility to your post by informing others of actions, or in this case, non-actions. You sternly address that this social media platform is NOT a law enforcement matter (duh). You use a hashtags that is trending (#Facebookdown) that will help increase visibility in your tweets. You highlight the importance of being current and active on recent news/events. You stress the importance of engaging with your social media users on various social media platforms. Flying a drone and causing trouble during an actual call? See, I told you that it would happen. To verify, check my documentation from my AAR on 03-06-14 (AirOps Branch-Observation/Recommendation-3 on page 16). SPRINGFIELD, Ohio (AP) — A man is facing charges after deputies say he was flying a video camera-equipped drone that hindered the landing of a medical helicopter at an accident scene. 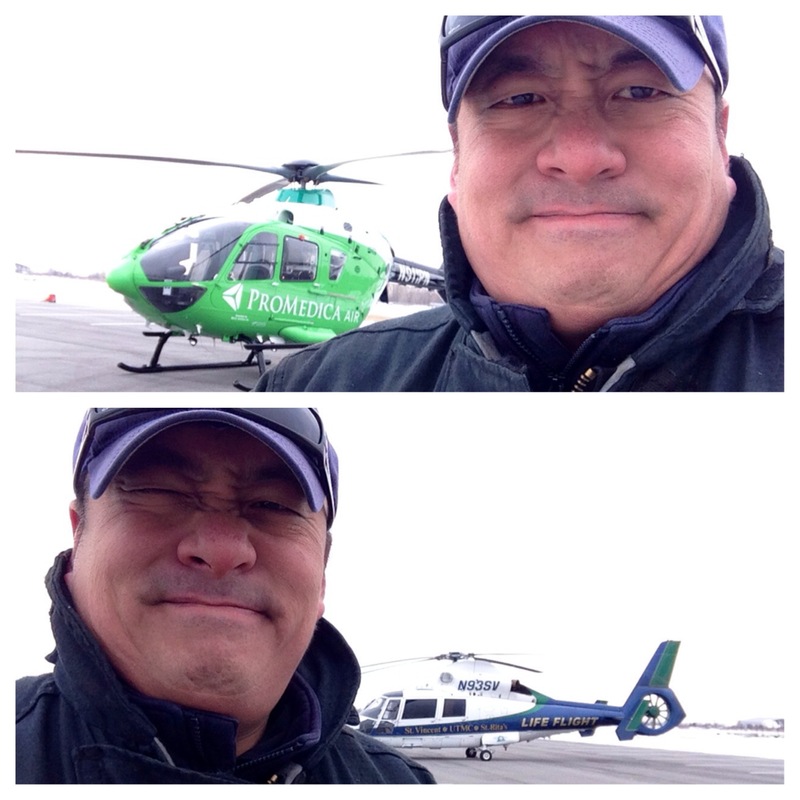 Kele Stanley, of Springfield, said he’s been unfairly charged and would have landed it immediately if he knew the medical helicopter was en route. “I’m not an idiot,” he said. The hobbyist was flying the $4,000 drone over a crash scene on Saturday morning to shoot photos and video. Authorities said both fire officials and a Clark County sheriff’s deputy told Stanley to stop flying his remote-controlled aircraft because the helicopter was preparing to land, and that he refused. The helicopter was able to land and depart safely from the scene. Stanley is facing a felony charge of obstructing official business and misdemeanor charges of misconduct at an emergency and disorderly conduct. He pleaded not guilty during a court appearance Monday and said he’s going to hire a lawyer to fight the charges. Stanley, a 31-year-old copy-machine repairman and videographer, said he flew his remote-controlled “hexacopter” about 75 feet above where a pickup had hit a tree in Moorefield Township near Springfield. He said he was shooting the video as a hobby and would have turned it over to local television stations, as he has done before. There currently are no regulations in Ohio governing private use of the unmanned aircraft, although law enforcement agencies must get special permits to use them. The Federal Aviation Administration bars the commercial use of drones. That’s right, she got caught because of her Facebook post. Colleen Cudney was convicted for DUI in 2012. One condition – she is to submit to random breathalyzer tests. Fast forward to St Patrick’s Day 2014 (March 17th, 2014). Colleen was out carousing and drinking. On Tuesday March 18th, 2014, Colleen gets called in for a random breathalyzer test. Well, well, well…..Local law enforcement called Colleen back again for an additional urine test. Colleen had indeed failed the more precise urine test. At this time, Colleen is looking at an additional 93 days in jail from the 18th District Court in Michigan for violating her parole. Nice work Colleen. Shockingly, Colleen has since deleted her Facebook post and her Facebook account. Hmmmmm. Morale of the story: Know the power of social media because what you post, isn’t really private.